Rules and regulations for using the study rooms, including usage rules and making reservations. Each study room is for current IU Northwest and current Ivy Tech students only, and they are not available to faculty, staff, or community patrons. The purpose of study rooms is to provide all students with quiet and private study space so that they made do their work quietly alone or collaboratively as a group. All study rooms remain locked unless being used. Each study room can only hold a maximum of 4 students at a time. 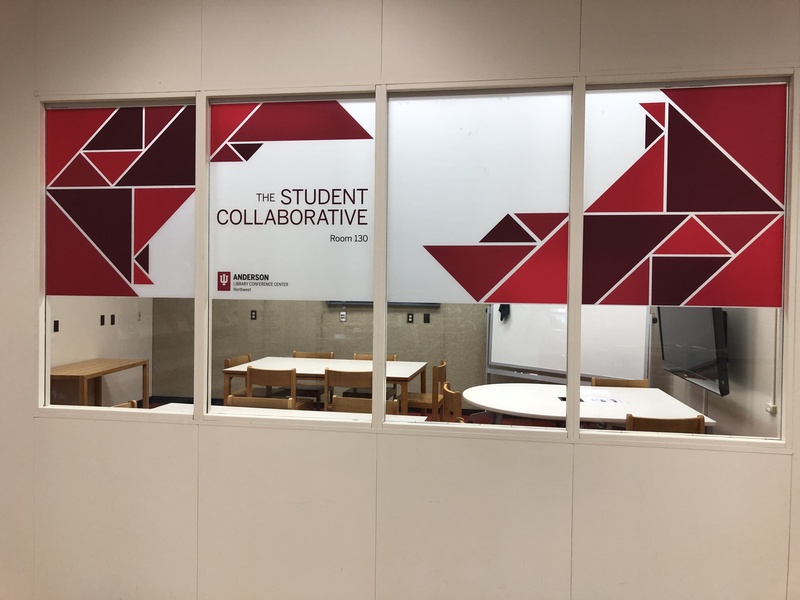 To use a study room, please present your student Crimson Card or Ivy Tech student ID at the circulation desk on the 1st floor. For groups of 2, 3, or 4, all students must present their Crimson Card/Ivy Tech student ID. The circulation clerk will scan your card(s) with a corresponding Study Room Key Card. Please keep the Key Card with you. When finished with the study room, please bring back the Key Card to the Circulation Desk. Reservations for study rooms are restricted to day-by-day only. You may reserve a study room 24 hours in advance with a 15-minute late grace period. If you are late for your reservation after the 15-minute grace period, it will be terminated and given to the next student request. Reservations during Mid-Terms Week and Finals Week are prohibited. Study rooms are only available to current IU Northwest and Ivy Tech students. This is because study space is scarce on campus. We ask students to abide by the following procedures and rules listed below. Note: the John W. Anderson Library faculty and staff reserve the right to refuse or ban any student from study rooms for any reason at any time. All study rooms remain locked until use. Please see the circulation desk to check out a study room. To check out a room, bring your Crimson Card or Ivy Tech ID to the circulation desk. Your card will be scanned along with a Study Room Card Key. You will hold onto the Card Key while using the study room. You must return the Card Key to discharge your time after study room usage. A student may use the room for up to 2 reservations a day. A student may use the study room for up to 2 hours with up to 3 other students. If there is at least 1 other study room available and there is no line, a student may check out a 2nd reservation and use it for another 2 hours. A student may reserve a study room for only 24 hours ahead of time. Students cannot reserve 2 or more days in advance. Please call the circulation desk at 219-980-6585 to make a reservation. If you fail to show up on time for your reservation, it will be forfeited to the next available student. 24 hour reservations are prohibited for Midterms Week and Finals Week. Please leave lights on and do not block any windows when occupying the room for security purposes. IU Northwest Library is not responsible for any lost or stolen items. Please keep on eye on your belongings. The Circulation Desk has a lost and found. For valuables, these items may have been turned in to Campus Police. IU Northwest John W. Anderson Library faculty and staff reserve the right to refuse or discharge any student from study rooms for any reason at any time. Failure to follow these rules will result in a permanent ban from using study rooms. If you are feeling cold, we have space heaters available for check-out at the Circulation Desk. Please leave space heaters on the floor plugged into a wall outlet only. Please return the space heaters to the Circulation Desk. Unlike study rooms, you do not need a reservation. Multiple groups are encouraged to use the room simultaneously.